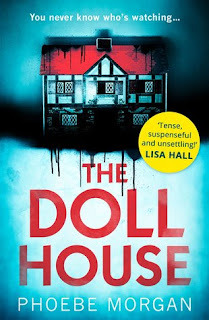 Corinne and boyfriend Dominic are going through the trials and tribulations of IVF when Corinne begins to find items from her childhood doll house mysteriously turning up in her home and workplace. Her mother tells her the doll house is safely stored away inside her attic, along with her deceased husband's other possessions, but when Corinne sneaks into the attic whilst staying over at her mum's, she can't find the doll house or anything else belonging to her late father. Where is it and why did her mother lie? I really enjoyed this fabulous psychological thriller. I loved how the tension gradually built into a marvellous, shattering crescendo when the truth finally became known. The only reality Corinne had ever known suddenly and inexplicably comes crashing down around her and even sister Ashley doesn't escape the repercussions. The book shifts back and forth between characters and it works exceptionally well. There's an unnamed person giving their perspective too and it all gets deliciously mysterious! My only criticism would be the author's obvious lack of research into childminding and yes, I'm an ex-childminder myself. A person must undergo rigorous background and health checks to be licensed and insured in the UK. It's not a job anyone can do. June, the childminder in the book, was portrayed as an older woman with health issues. She was openly swallowing pills and complaining of creaking joints to Ashley, whose child was in her care. Any sane parent would grab their child and swiftly do an Unsain Bolt with a rocket up their backside! Babysitters do not have to be OFSTED registered and inspected; childminders do. For purposes of authenticity and respect towards legitimate and hardworking childminders, June should have been described as a babysitter. So why have I overlooked my one gripe and given this book a top rating? That's easy to answer - this is a mighty fine debut from Phoebe Morgan. The writing is excellent, the characters are all fully developed and empathetic, the plot is suspenseful and the pacing is spot on. There's so much to love about this book. I was totally absorbed in the lives of these people. Enough said. My thanks to Phoebe Morgan, NetGalley and HQ Digital for providing a copy of this book.